On 7-13 February 1958, the representatives of the governments of eleven countries in Asia gathered in Saigon (now Ho Chi Minh City) to hold preliminary talks on establishing a permanent institution to promote and to improve public administration and governance in the region. At the Saigon meeting, it was decided that a general conference of states and institutions in the region should be convened in the Philippines in June of that year to consider the structure and other features of such a permanent regional body. 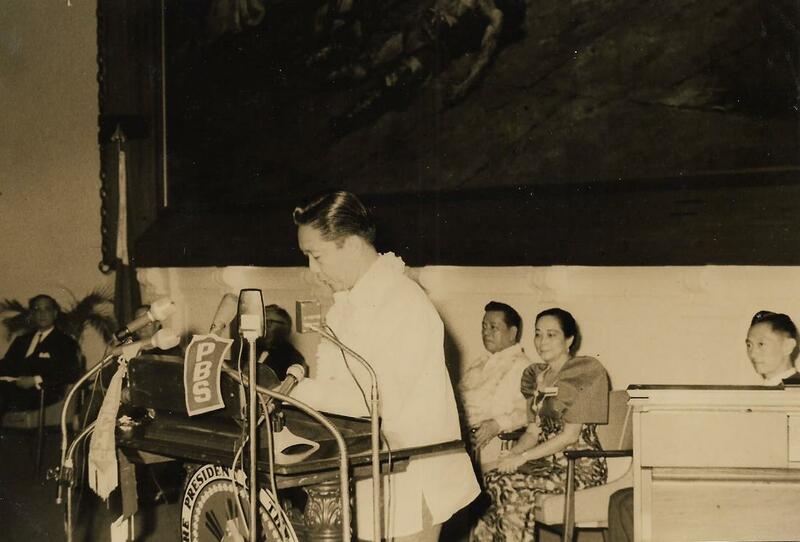 Accordingly, on 7-20 June 1958, a two-week event known as the Regional Conference of Public Administration (RECOPA) was held in the Philippine cities of Manila and Baguio. In attendance were some 80 delegates and observers from Australia, the Republic of China (Chinese Taipei), Hong Kong (then a British Crown Colony), India, Indonesia, Japan, the Republic of Korea (South Korea), New Zealand, Pakistan, the Philippines, Singapore, and the Republic of Vietnam (South Vietnam). International organizations such as the American Society for Public Administration (ASPA), the Public Administration Service (PAS), the Asia Foundation, the International Institute of Administrative Sciences (IIAS), and the United Nations Technical Assistance Administration (now United Nations Development Programme) were also represented. Among other matters discussed in the conference, it was decided to create a regional organization in order to help advance the economic and social development of the region through the promotion of the study, practice and status of public administration and adoption of good administrative systems. In the words of President Carlos P. Garcia, "It is therefore my fervent hope that the deliberations will provide the groundwork for the organization of an international body of public administrators whose leadership may well secure the most efficient and competent service from the particular states of which they are citizens." The constitution was drafted and a provisional Executive Council was elected. The Committee on Constitutional Review was composed of Dr. Franklin Chi-Ch'ing Yao of the Republic of China (Chinese Taipei), Mr. Hiromu Fukada of Japan, Dr. Vu Quoc Thong of the Republic of Vietnam (South Vietnam), and Mr. Paul A. Schillings of the IIAS. This Council met in Hong Kong on 15-19 December 1959 to discuss the final details for implementing the plans of the organization. Prof. Carlos P. Ramos of the Philippines was made Provisional Chairman of the Executive Council, and Dr. Jose V. Abueva of the Philippines was made Provisional Secretary-General to prepare for the founding of the organization. Centers were created in Saigon, Vietnam (Research, Documentation, and Diffusion), New Delhi, India (Training Center), and Manila, Philippines (Secretariat). 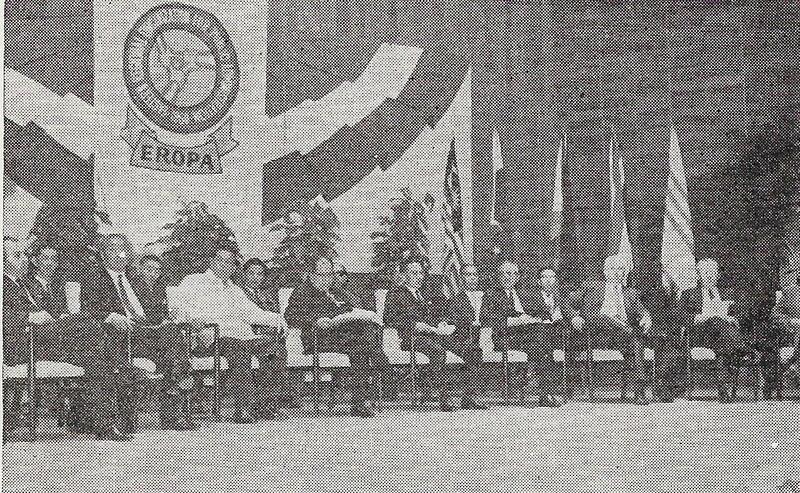 The First General Assembly and Conference of the Eastern Regional Organization for Public Administration (EROPA) was conducted in Manila on 4-10 December 1960. The Constitution of EROPA took effect on 5 December, when five states in the region, namely Australia, the Republic of China (Chinese Taipei), Japan, the Philippines, and the Republic of Vietnam (South Vietnam), became the founding state members of the organization. Honorable Serafin Salvador of the Philippines was elected the first Executive Council Chairperson, and Dr. Shou Sheng Hsueh of Hong Kong was elected the first Auditor. The representatives of Japan and Vietnam were elected Vice Chairpersons. Meanwhile, Ramos was elected the first Secretary-General. 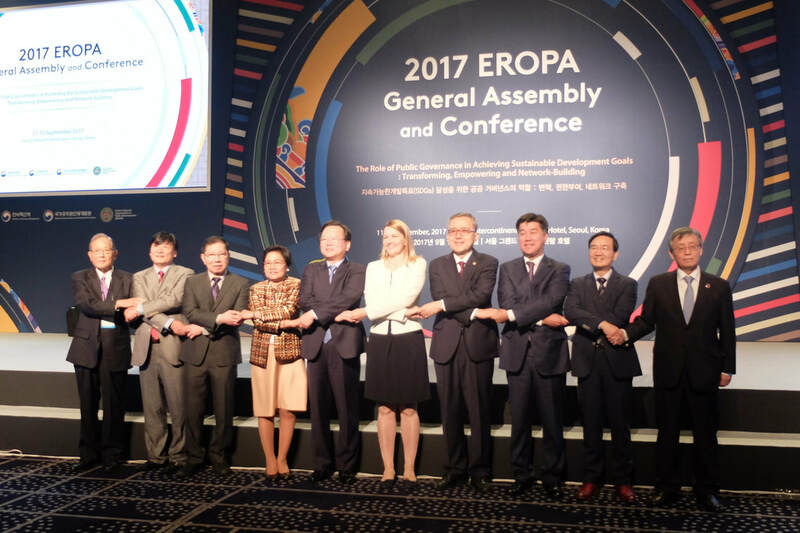 On the same day, the first EROPA General Assembly was formally opened in the Conference Hall of the regional headquarters of the World Health Organization (WHO) in Manila. Filipino President Carlos P. Garcia addressed the Assembly at the Opening Session, while Manila City Mayor Arsenio H. Lacson addressed the Assembly at the Closing Ceremony. Founding institutional members (7) include the Indian Institute of Public Administration (IIPA), Indonesian Institute of National Administration (now National Institute of Public Administration), the University of Hong Kong, Korean Association of Public Administration, Society for Public Administration in the Philippines, Vietnamese Association for Administrative Research, and the Confederation of Government Employees Organization in the Philippines. The conference accommodated delegates and observers from the United Nations (UN), International Institute of Administrative Sciences (IIAS), International Union of Local Authorities (IULA), American Society of Public Administration (ASPA), International Cooperation Administration (now United States Agency for International Development), Association of Government Accountants in the Philippines (AGAP), Confederation of Records Management Associations of the Philippines, Government Training Officers Association of the Philippines, Indo-Pacific Council of Comité International pour l'Organisation Scientifique, League of Governors and City Mayors (later divided into the League of Provinces of the Philippines, and the League of Cities of the Philippines), and the University of the Philippines. President Garcia signed Proclamation No. 722 on 18 November 1960 declaring 4-10 December as Public Administration Week. In the tradition of geographers, a region is a definite unit, with its special individuality of geologic formation, climate, vegetation, landscape, and human culture. On the other hand, it may be hypothesized that perhaps the odd-line concept of a region cannot and should not apply to the purposes of RECOPA and of the proposed permanent organization. Thus, a "region" was assumed to exist for purposes of sharing common concerns. 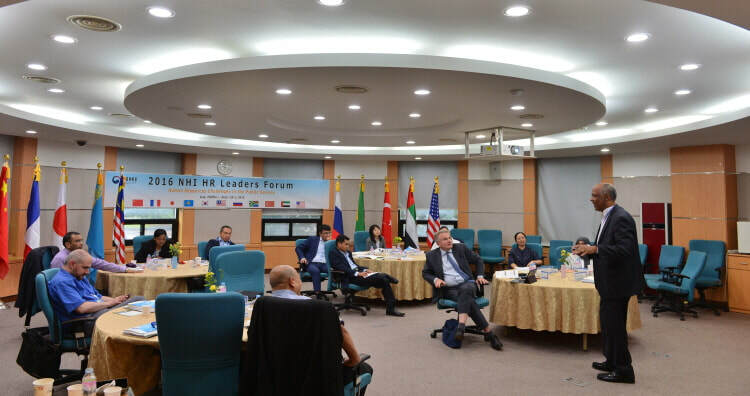 The very diversity of the participating countries drew them together to exchange ideas and practices from their varied national experiences to seek that common goal of improving public administration for economic and social advancement. Opening session of the First General Assembly and Conference of EROPA. Delegates met in the First General Assembly and Conference (1960) at the World Health Organization (WHO) regional headquarters. On 1 July 1961, Thailand was admitted as the sixth member of the EROPA through the National Institute of Development Administration (NIDA). In October 1961, state membership offers were given to Iran and Afghanistan. On 3 April 1962, the EROPA was officially registered under the laws of the Republic of the Philippines. The organization maintains its headquarters in the Philippines to this day. On 6 October 1962, the Republic of Korea (South Korea) was admitted as the seventh state member of the EROPA through the Ministry of Government Administration (later divided into the Ministry of Government Administration and Home Affairs, the Ministry of Public Safety and Security, and the Ministry of Personnel Management). On 21 October to 6 November 1963, a project on Central Services to Local Authorities was undertaken in cooperation with the United Nations. In July 1963, Iran became the eighth state member of the EROPA through the State Organization for Administrative and Employment Affairs (now Administrative and Recruitment Affairs Organization). The EROPA Local Government Center is based in the Local Autonomy College, which is currently under the Ministry of Internal Affairs and Communications. The Local Government Center was created on 1 October 1964 in Tokyo, Japan. Since then, they have been conducting international training programs which received more than 600 participants from 65 different countries. The Third General Assembly and Conference held in Seoul, Republic of Korea on 7-17 November approved the creation of associate membership for institutions and individuals. This allowed institutions and individuals outside Asia and the Pacific region to join the EROPA. This also realized the notion of understanding "region" as "shared concerns and goals" than mere geographical or cultural considerations. The First Asian Consultative Conference on Foreign Service Development was held in Manila, Philippines on 27 September to 1 October 1965. It had more than 70 participants from at least 20 countries. Among the keynote speakers were Honorable Nasrollah Entezam, President of the United Nations General Assembly from 1950 to 1951, and Dr. Victor Chi-tsai Hoo, Assistant Secretary-General of the United Nations from 1946 to 1947. Filipino President Diosdado Macapagal signed Proclamation No. 447 on 6 September 1965 declaring 27 September as EROPA Day. In signing, Macapagal states that since its formation in 1960, the EROPA has been an effective instrument for bringing about good government among the member countries and fostering regional cooperation in the field of public administration. Pakistan was admitted as the ninth state member of the EROPA in October 1965. Speakers of the First Asian Consultative Conference on Foreign Service Development. The EROPA Development Management Center is based in the National Human Resources Development Institute, which is currently under the Ministry of Personnel Management. In 1966, the organization was accorded with Special Consultative Status (formerly Consultative Status Category II) by the United Nations Economic and Social Council (ECOSOC). The organization was also accorded a permanent seat in the annual meeting of the United Nations Economic and Social Commission for Asia and the Pacific (ESCAP) in Thailand. This highlights the cooperation between EROPA and the United Nations. Since then, the EROPA had been sending representatives to the United Nations. In the same year, the Organization and Management Center (now Development Management Center) was created in Seoul, Republic of Korea (South Korea). Since then, they have conducted international executive development and human resource development programs. Malaysia was admitted as the tenth state member of the EROPA through the Public Service Department in December 1966. The First Foreign Service Course was conducted from 21 July to 9 September 1967 in the Philippines. Upon the recommendations of its participants, the Second Foreign Service Course followed, which was held in the Republic of Korea from 5 July to 9 August 1969. The course was made to study and analyze significant problems of foreign relations, provide an opportunity for improving knowledge and skills in diplomacy, and broaden the perspective of foreign relations in terms of shared development. In the words of President Ferdinand Marcos, "The establishment and preservation of regional harmony will exercise the vital role in the management of world peace." In September 1967, the Center for Land Reform and Rural Development was created in Taipei, Republic of China (Chinese Taipei). Ferdinand Marcos, President of the Philippines (1965-1986), addresses the First Foreign Service Course. Indonesia was admitted as the eleventh state member of the EROPA through the National Institute of Administration (now National Institute of Public Administration) in September 1969. It was formally approved by the Sixth General Assembly in May 1971. In the same year, state membership offers were given to India, Cambodia, Laos, Nepal, and Singapore. 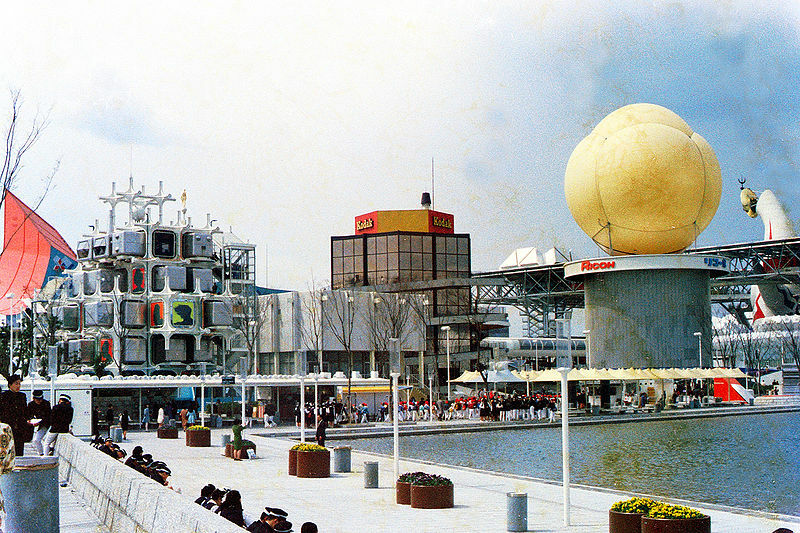 In cooperation with the Commemorative Association for the Japan World Exposition (日本万国博覧会, Expo '70), the EROPA was able to undertake a number of activities, including the Sixth Foreign Service Course, held on 22 June to 29 July 1974 in Manila, Philippines and Berlin, Germany, as well as the Eight General Assembly and Conference on Asian Development Strategies and the Role of Public Enterprise, held in Iran on 16-23 October 1976. In 1976, the Socialist Republic of Vietnam assumed the state membership of the Republic of Vietnam through the Public Administration School (now National Academy of Public Administration). 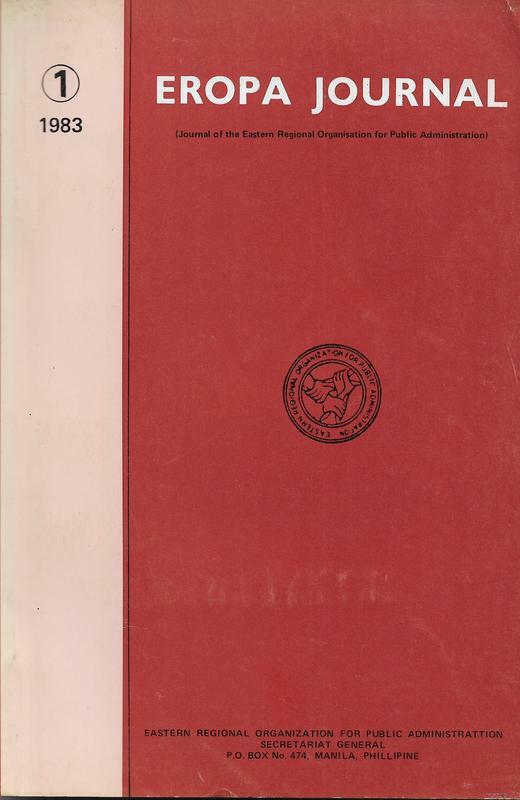 ​The Research, Documentation, and Diffusion Center in Saigon was discontinued as an effect of the Vietnam War (1955-1975), resulting to the loss of the organization's publications, including the flagship journal EROPA Review (published since 1960). The Secretariat in the Philippines assumed the publication tasks of the organization with the launch of the official newsletter, the EROPA Bulletin. Abelardo Subido, Commissioner of the Philippine Civil Service, served as its first editor. In December 1980, Nepal became the twelfth state member of the EROPA through the Ministry of General Administration. In the same year, state membership offers were given to Bangladesh and Myanmar (Burma). In January 1982, Dr. Raul P. De Guzman of the Philippines assumed the position of Secretary-General, succeeding Ramos. In the same year, the EROPA Bulletin resumed publication after a five-year hiatus with Arturo Pacho as editor. The EROPA Journal was published to succeed the defunct EROPA Review as the organization's flagship journal. Dr. Inayatullah of Pakistan became its editor. The EROPA Journal will continue until 1984, when the organization shifted support to existing publications such as the Philippine Journal of Public Administration, and the Indian Journal of Public Administration. EROPA commemorates its Silver Jubilee (25th anniversary) with eleven state members, 52 institutional/group members, and 105 individual members. The EROPA Educational Development Fund was established to help finance scholarships, research projects, seminars, workshops, and related activities. In December 1985, India became the thirteenth state member of the EROPA through the Ministry of Personnel, Public Grievances and Pensions. In the same year, state membership offers were given to Brunei Darussalam and Sri Lanka. The EROPA cooperated with the United Nations Educational, Scientific, and Cultural Organization (UNESCO) to accomplish a special project on the assessment and evaluation of public administration education and research in 1986. Two years later, the two organizations collaborated for a special project on public management education. ​In the same year, the 32nd Executive Council Meeting and Conference held in Bangkok, Thailand on 7-9 November approved the creation of associate membership for nations. This allowed states outside Asia and the Pacific region to join the EROPA. This also realized the notion of understanding "region" as "shared concerns and goals" than mere geographical or cultural considerations. 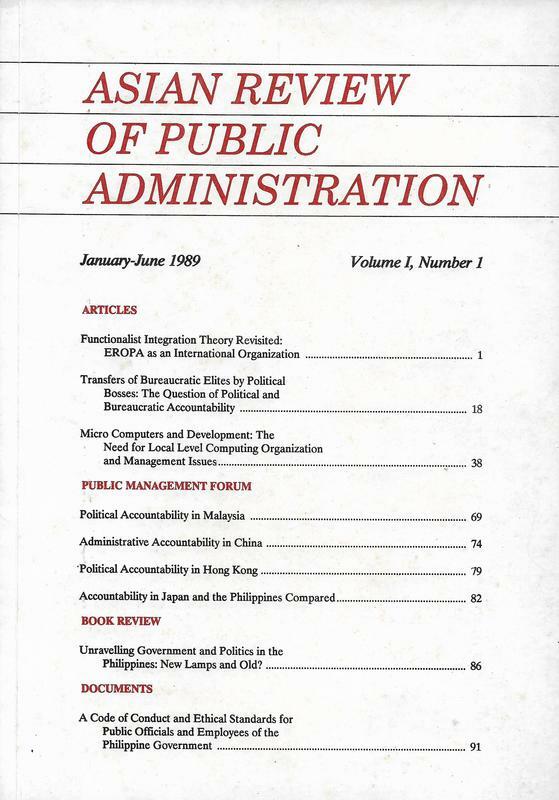 The Asian Review of Public Administration was launched as the flagship journal of the organization, succeeding the EROPA Journal in 1989. Prof. Mila Reforma was designated as its first editor-in-chief, and Dr. Danilo Reyes as its first associate editor. The journal continues to be published to this day. ​In the same year, the People's Republic of China assumed the state membership of the Republic of China through the Ministry of Personnel (now Ministry of Human Resources and Social Security). In 1995, the EROPA cooperated with the International Institute of Administrative Sciences (IIAS) for a project on In-Service Training as an Instrument for Organizational Change in Public Administration. Also, a project to publish the Profiles of Government Administration in Asia was done by EROPA in cooperation with the Australian Public Service Commission. In the same year, state membership offers were given to Mongolia. In January 1996, Ms. Patricia A. Sto. Tomas of the Philippines assumed the position of Secretary-General, succeeding De Guzman. In cooperation with the United Nations, the EROPA conducted the Regional Conference on Public Administration in Promoting Economic Development at Manila, Philippines on 18-20 March 1996. It was attended by participants from at least 20 countries. The EROPA signs an affiliation agreement with the Commonwealth Association for Public Administration and Management (CAPAM), an international network of public service managers, global researchers, and non-governmental organizations from 50 countries founded in 1994. A similar agreement has been proposed with the IIAS. The Human Resource Development Center was proposed to be created in Tehran, Iran. It had undertaken training programs and development projects involving EROPA members and the newly independent states from the former Soviet Union, namely Armenia, Azerbaijan, Belarus, Estonia, Georgia, Kazakhstan, Kyrgyzstan, Latvia, Lithuania, Moldova, Russia, Tajikistan, Turkmenistan, Ukraine, and Uzbekistan. EROPA commemorates its Ruby Jubilee (40th anniversary) with twelve state members, 73 institutional/group members, and 282 individual members. Joseph Ejercito Estrada, President of the Philippines (1998-2001), addresses the World Conference on Governance. Fidel V. Ramos, President of the Philippines (1992-1998), meets Hage Geingob, Prime Minister (1990-2002, 2012-2015) and President (2015-present) of Namibia at the World Conference on Governance. The official website of the EROPA was launched on 31 January 2000, ushering the affairs of the organization to the digital age. To date, the organization's online services reached people from more than 150 nations. The EROPA was designated as an Online Regional Center (ORC) of the United Nations Public Administration Network in 2001. The long-term objective of UNPAN is to build the capacity of regional and national institutions in order to access, process, and distribute relevant information for the promotion of better public administration and governance by means of information and communication technologies (ICTs). As one of the network's founding partners, it has actively cooperated with the UNPAN since then. The 20th General Assembly and Conference organized by the EROPA in Hanoi, Vietnam from 9-14 October 2005 emphasized the Millenium Development Goals (MDGs), the agenda of the United Nations for international development set to be achieved by 2015. This displays the support of the organization to the aims of the United Nations. In cooperation with the United Cities and Local Governments (UCLG), the EROPA completed the Asia and the Pacific part of the Decentralization and Local Democracy in the World: First Global Report. EROPA commemorates its Golden Jubilee (50th anniversary) with ten state members, 50 institutional/group members, and 274 individual members. ​In October 2010, Dr. Orlando S. Mercado of the Philippines assumed the position of Secretary-General, succeeding Sto. Tomas. The First Asian Leadership Forum (ALF) was launched in the 56th Executive Council Meeting and Conference held from 21-25 November 2010 in Kathmandu, Nepal. Proposed and chaired by Dr. Akira Nakamura of Japan, it featured prominent leaders articulating on specific issues and topics in public administration. The speakers for the first forum were Dr. Jiang Wu of the People's Republic of China, Mr. Hitoshi Kimura of Japan, Dr. Francisco Duque III of the Philippines, and Dr. Yuba Raj Khatiwada of Nepal. The EROPA Experts and Practitioners (ExP) was established in 2011 to become an online database of selected public administration experts and practitioners from EROPA members. To date, there are 17 experts from 10 countries. The Outstanding Young Practitioner Award (OYPA) was conceptualized to recognize in the field of public administration and governance who are engaged in creating social and economic development through public service. The first award was granted in 2012. The EROPA E-Government Research Center is based in the Chinese Academy of Personnel Science, which is currently under the Ministry of Human Resources and Social Security. In 2012, the EROPA Online Youth Network (OYN) was set up in cooperation with the Institute of Public Administration of Canada (IPAC) in accordance to an agreement between the two organizations to share research, information, experience, and skills, as well as undertake joint programming and publications to foster and support excellence in public administration. In May 2014, the E-Government Research Center was created in Beijing, People's Republic of China. Since then, they have conducted international seminars on e-governance attended by participants from various countries. In 2015, the website of the Asian Review of Public Administration (ARPA) was launched to allow open access for its articles. In 2016, state membership offers were given to Bhutan, Kazakhstan, and Uzbekistan. The 26th General Assembly and Conference organized by the EROPA held from 11-15 September in Seoul, Republic of Korea focused on the Sustainable Development Goals (SDGs), the agenda of the United Nations for international development set to be achieved by 2030. This displays the support of the organization to the aims of the United Nations. With more than 600 participants from at least 17 countries, it has become one of the largest conferences hosted by the organization. On the eve of the organization's diamond jubilee (60th anniversary), the EROPA had ten state members, 100 institutional/group members, and 667 individual members. Opening ceremony of the 26th General Assembly and Conference of EROPA. Since its inception to this day, EROPA has been undertaking various activities in pursuit of the objectives it has set forth largely through the help of governments who are state members of EROPA, and financial support of other international organizations. Join EROPA and become an active part of the organization's service to the region and the world.